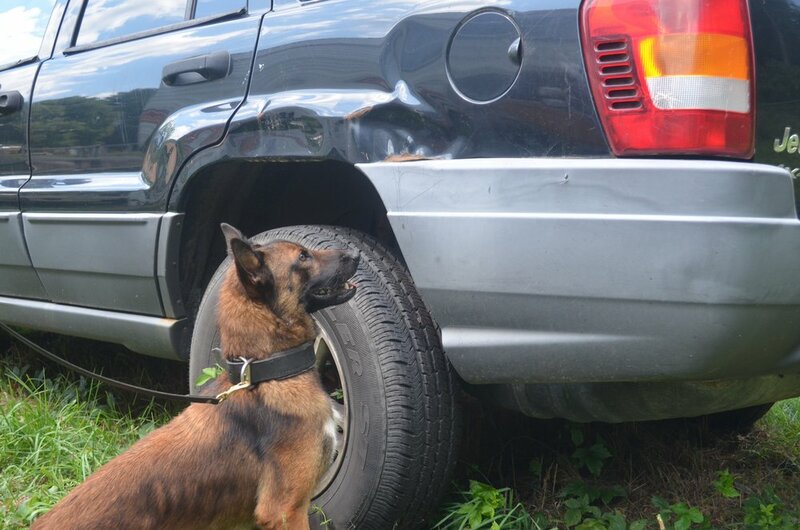 K9 Proving Ground Narcotics Detection Dogs have been to proven to have effective and efficient results. Our dogs are carefully selected and raised in order to create world-class detector canines. Desensitization and training begins at an early age followed by imprinting our dogs on the industries leading training aids. Our dogs are proven to successfully locate and alert on the presence of all various quantities of drugs and paraphernalia no matter how "hidden" drug smugglers believe it to be. There is no amount of narcotics too small or too big that K9 Proving Ground Narcotics Dogs can't find. Our dogs are trained to perform large area searches, vehicle searches, and building searches. K9PG provides healthy, physically conditioned, social, environmentally stable, level headed, easy to read, effective and efficient dogs with high success rates. Methamphetamines/ Amphetamines, Cocaine/Crack, MDMA/Ecstasy, Marijuana/Hashish, Heroin/Opiates, and PCP. After our imprinting stage of training and developing a desired indication or shaped behavior, our dogs go through odor recognition tests (ORT) in order to verify that the dog recognizes all of the target odors and can successfully locate and correctly indicate in an efficient time period while working through distractions. During the final stages of our intensive narcotics detection program, our dogs are put through real life scenarios and worked on a regular basis. By doing this our dogs are immediately ready for deployment and will successfully locate and indicate on the presence of narcotics and their derivatives in situations and environments that they will encounter and be utilized by law enforcement and government agencies.